Lucasfilm has done a fabulous job of documenting all aspects of the making of Star Wars movies and turning that into revenue for the company. Many Star Wars fans are just as eager to learn about the behind the scene happenings for their favorite movies as they are to watch the movies. For example, The Making of Star Wars was a 1 hour special that aired on ABC in 1977 just four months after the film was released. Another example is the book The Secrets of Star Wars: Shadows of the Empire which details the Shadows of the Empire multimedia project. Fans may complain about the tweaks George Lucas has made to the movies over the years, but those same fans continue to buy every new version of the movies and argue the merits of those changes. Deleted and alternate scenes are just as eagerly viewed by fans as those scenes that make it into the final cut of the movies. 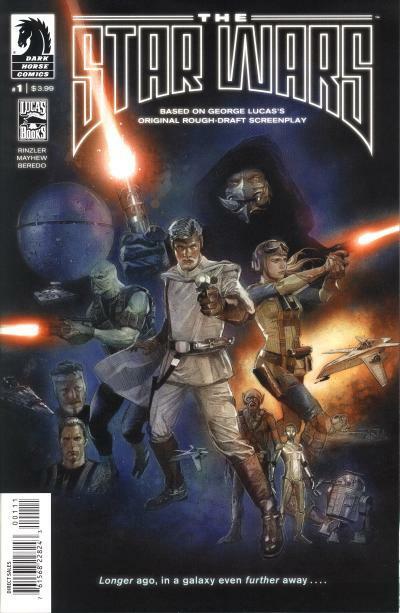 It is with this enthusiasm for all things Star Wars that Dark Horse was able to convince George Lucas to allow them to publish The Star Wars, a comic adaptation of Lucas' original draft screenplay from 1974. 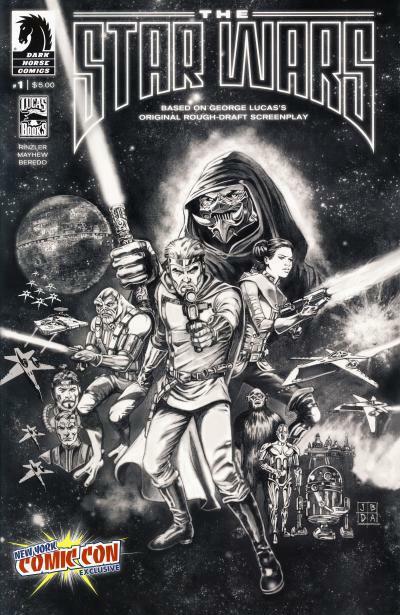 Hasbro helped pave the way for this comic adaptation with their hugely popular Star Wars action figures based on the concept art for Star Wars. 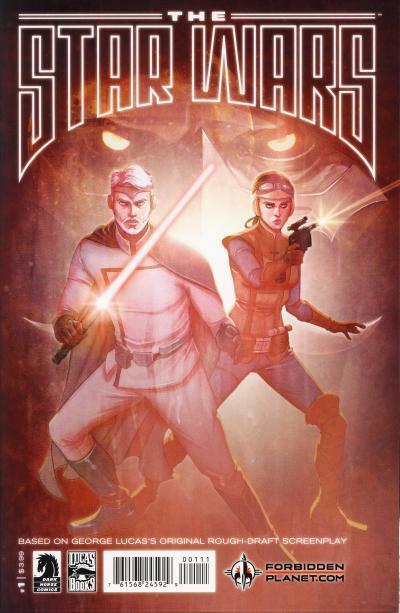 The Star Wars is an 8-issue mini-series with one companion #0 issue. (As a further example of Star Wars fans wanting to know about the behind the scenes happenings, the companion #0 issue contains the design process Dark Horse went through to imagine this different, yet familiar story.) 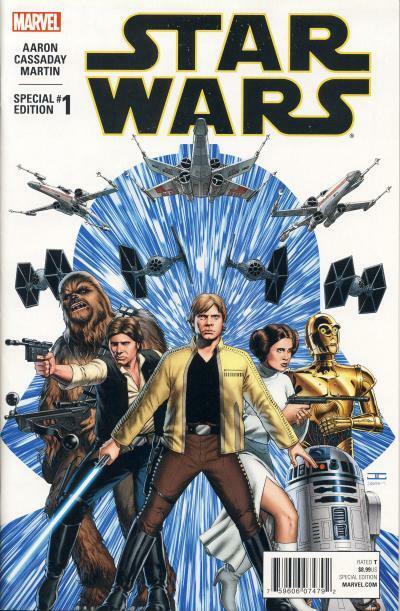 The Star Wars #1 was published in September 2013. The 3 solicited issues all contain a cover that pays homage to the classic Tom Chantrell Star Wars poster. Nick Runge provides the art for the standard cover for all 8 issues of this series. Jan Duursema, probably the most prolific Star Wars artist Dark Horse had, provides the art for the variant cover. 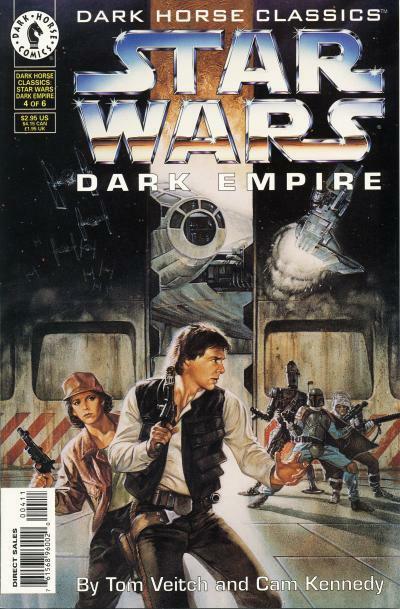 The ultra variant cover is drawn by Doug Wheatley, best known for his art on the Star Wars: Dark Times series. 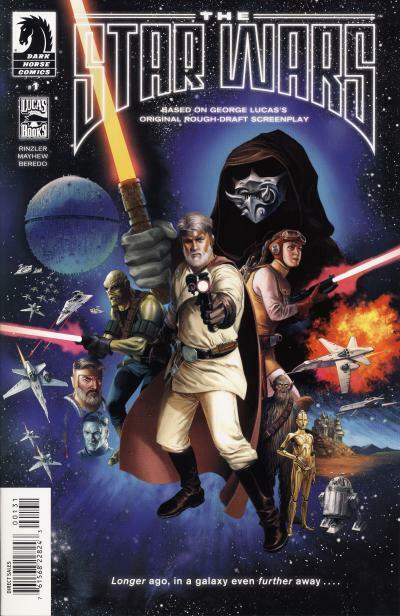 General Luke Skywalker is front and center on all 3 covers and is drawn mostly the same by the 3 artist, although the Doug Wheatley Luke bears a striking resemblance to George Lucas! But their different interpretation of Han Solo (to Luke's right) and Princess Leia (to Luke's left) as well as Chewbacca, C-3PO, and R2-D2 is interesting. Like the interior art, the cover art is based on the Ralph McQuarrie concept art for Star Wars. There are 3 store exclusives for The Star Wars #1 from Midtown Comics, Things From Another Universe, and Forbidden Planet. 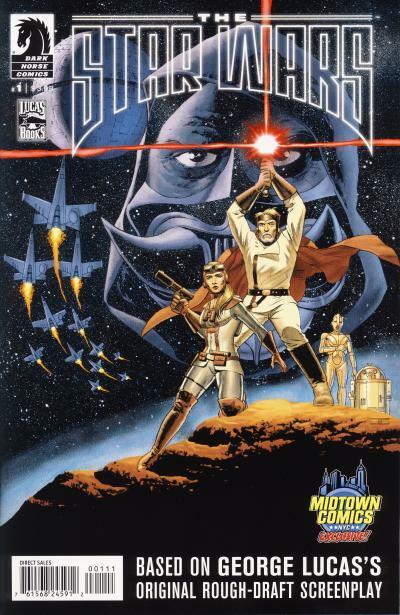 The Midtown Comics exclusive cover is a homage to the Tom Jung/Hildebrandt Brothers Star Wars posters. The cover art on the Things From Another Universe and Forbidden Planet exclusives is the same, with only the store branding being different. The New York Comic-Con exclusive is a black and white version of the Jan Duursema cover. The Star Wars #1 was eagerly anticipated and sold out quickly. Dark Horse went back to print with a virgin cover based on the standard Nick Runge cover. Finding information about non-Western comics can be a chore at times. Sometimes I get lucky and find a web posting or talk to someone who has information that helps me better understand the comic. In the case of the Arabic Star Wars trade paperback, all I have been able to determine is it was part of a series that included comic adaptations for Close Encounters, Battlestar Galactica, Meteor!, James Bond: For Your Eyes Only, and Charlies Angel's. Most of these are adaptations from Marvel Comics, but the Charlies Angel's comic is unknown to me. It might be a collection of the comics that ran in the British Look-in magazine in the early 1980s. What all these comics have in common is they are based on properties that were popular in the late 1970s and early 1980s, making it likely the Arabic Star Wars comic was published in the early to mid 1980s. Based on the logo on the cover which matches the logo found on the Beyond the Universe issues with Star Wars inside, I believe the publisher is Flying Carpet from Lebanon. This trade paperback is read in reverse from how we read books in the U.S. For this reason, the images on the interior pages are mirror images of the pages published in the U.S. This comic is slightly smaller than a modern U.S. comic. Pages are in black and white or color and the last few pages of the trade paperback contain pictures from the movie with text. The front cover shows the famous Brothers Hildebrandt poster created for the movie. 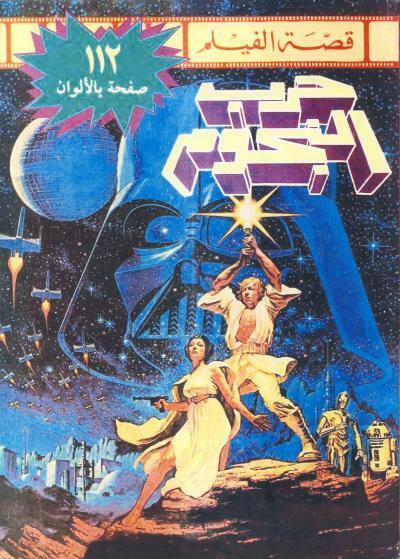 The back cover is the same as the back cover for Star Wars Marvel Special Edition #2, except the Arabic cover zooms in on Luke Skywalker and Princess Leia's swing across the Death Star chasm and cuts off much of the Death Star and the action around it. As always, if you have more information concerning this comic, I would appreciate hearing from you. The Five Below Star Wars Special Edition #1 became available to fans on Force Friday. Like the Five Below Star Wars: Darth Vader Special Edition #1, the easiest way to identify this comic is the words "Special Edition", the cover price of $8.99, and the back cover ad for the Princess Leia trade paperback due in November 2015. I believe these regional Five Below exclusives flew under the radar of many Star Wars comic collectors, myself included. Even if collectors did know about them, there are two things that work against these comics becoming valuable; they are reprints and have a high cover price. Copies have been selling for $5 - 15 on eBay. At midnight on September 4, 2015, the first mass release of Star Wars: The Force Awakens merchandise took place in an event known as Force Friday. This worldwide event gave Star Wars fans the ability to purchase a myriad of items over 3 1/2 months before the movie is due to hit theaters. Participating retailers in the U.S. who opened their doors at midnight include: Target, Toys R Us, and Walmart. 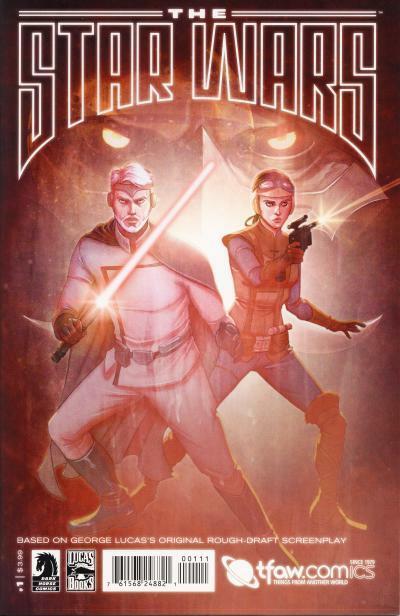 Unfortunately, the first issues of the Marvel mini-series Star Wars: Shattered Empire was not available on September 2 as originally planned, but instead shipped on September 9. What was available to U.S. east coast fans on Force Friday was 2 Star Wars comics from the discount store Five Below. Five Below Star Wars Special Edition #1 and Five Below Star Wars: Darth Vader Special Edition #1 reprint the 1st and 2nd issue of each series respectively. 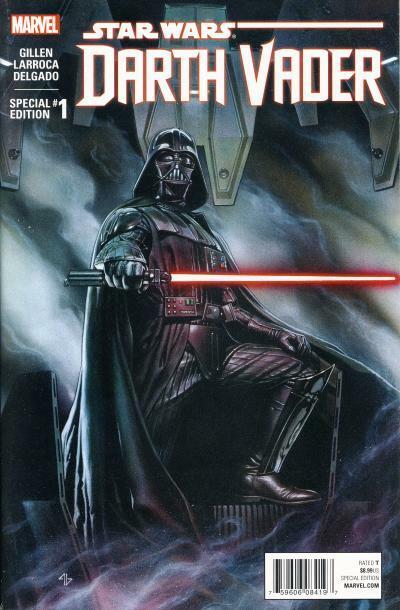 The front cover for Five Below Star Wars: Darth Vader Special Edition #1 is the same cover as Darth Vader #1 published in February 2015. While the cover does not contain the full title, the indicia does use the elongated title and shows a date of October 2010. The easiest way to identify this comic is the words "Special Edition" and the cover price of $8.99. 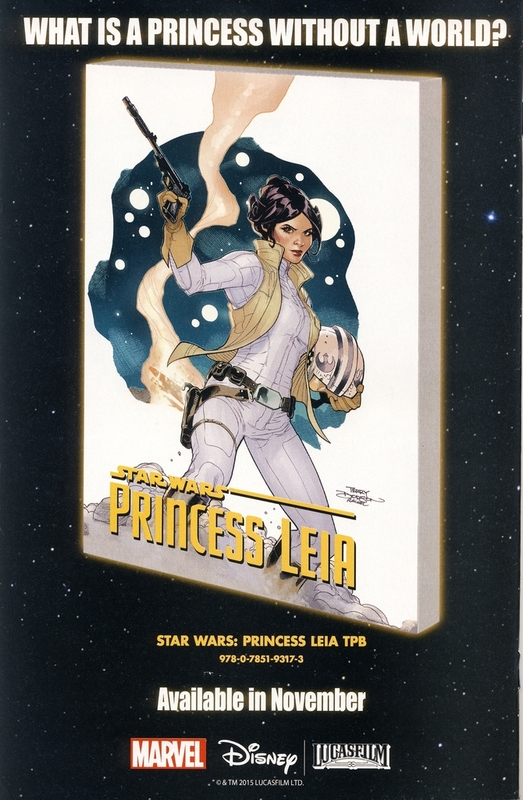 Additionally, the back cover shows an ad for the Princess Leia trade paperback due in November 2015. Misleading covers are a trope of comics books dating back to the earliest days of comics in the U.S. In the Golden Age, covers would depict superheroes battling Axis forces, sometimes coming face to face with Hitler, Mussolini, or Hirohito, but few of the stories inside the issues would feature these epic battles. Later on in the Silver Age, DC would perfect the misleading cover, often showing its heroes in outlandish situations that enticed the reader to want to learn more by reading the story inside. While misleading covers tapered off in the Bronze Age, they still are used to this day. 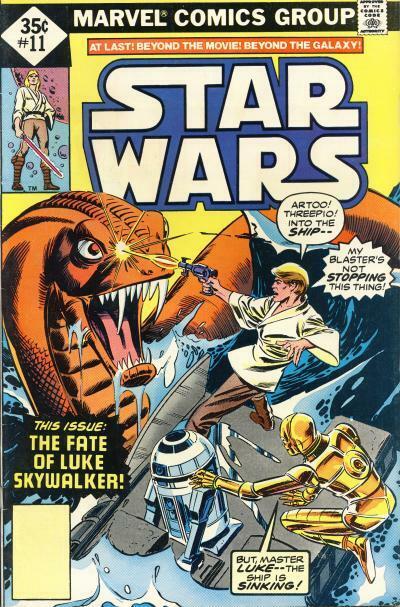 Marvel's Star Wars title had it's fair share of misleading covers including the cover to Star Wars #71. In a story titled Return to Stenos, Luke Skywalker and Lando Calrissian track bounty hunters Bossk and IG-88 to the planet Stenos in the hopes they will lead them to Boba Fett. Ultimately, their sojourn to Stenos proves to be a dead end. The cover for Star Wars #71 takes place at the end of the issue when Luke and Lando discover that the metal storage block they are chasing does not hold Han Solo, but instead contains a Rodian named Chihdo. Obviously the cover is misleading as the character in the block does not have any features that a Rodian possess but does look like a human. The reader is meant to believe this is Han Solo and the cover even uses his name in the text to further reinforce this misdirection. 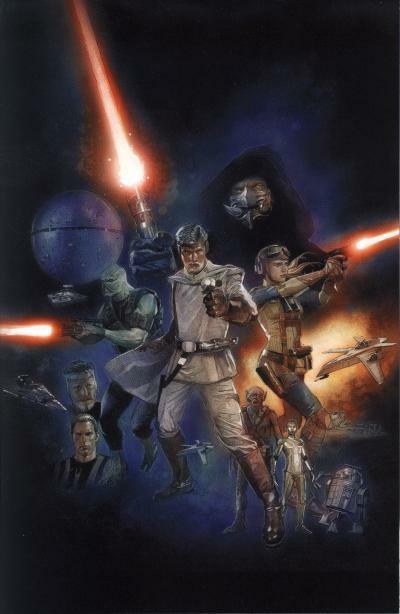 Additionally, the cover shows Luke and Lando under fire, which never occurs in the issue (or the subsequent issue) which ends with our heroes not wielding weapons surrounded by Bossk, IG-88, and their henchmen. 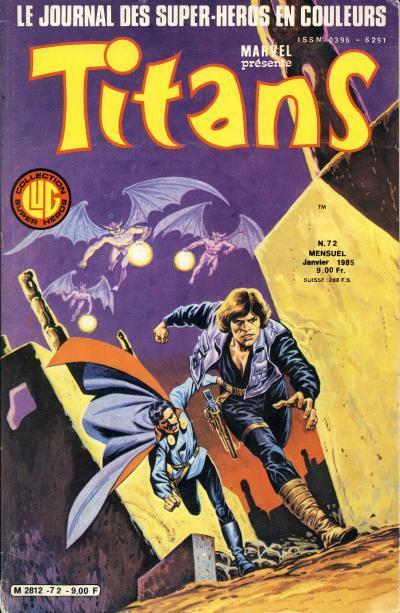 The cover for Titans #72 is another nicely painted French cover showing a scene earlier in the story where Luke and Lando are chasing after Bossk in the streets of Stenos' capital city. The picture of Luke and Lando is lifted from the last panel on page 11. The 3 flying humanoids in the backgrounds are Stenaxes, natives of the planet. Despite what the cover would have you believe, they are not chasing our heroes, making this another misleading cover. Luke does mention in the story to Lando that their escape from a mob could be worse if the Stenaxes decide to get involved, but they never do. For this reason, Titans #72 is not as egregious as Star Wars #71 in misleading the reader about the content of the story inside. Both covers do a good job however of capturing the frantic and action packed pacing of the story inside. Most Marvel Star Wars issues have 2 different cover variations. The cover differences denoted the different distribution methods used and helped Marvel know which copies were returnable and which were not. The copies distributed to newsstands have a UPC symbol in the lower left hand corner box and unsold copies were returnable. The direct copies have either a fat or thin diamond in the upper left hand corner with a blank box or picture in the lower left hand corner box and were not returnable. Many early direct copies were distributed by the Western Publishing Company in their Whitman 3-packs and are sometimes know as Whitman variants although these comics were not exclusively distributed in this manner. Interestingly, Diamond Comic Distributors, the current exclusive distributor of most comics in the U.S., was named after the diamond symbol Marvel used on their direct market copies. Star Wars #11 has 3 different cover variations. Star Wars #11 has the standard newsstand and direct versions. There is a 2nd direct version which has the diamond in the upper left hand corner but also has a UPC symbol in the lower left hand corner box. It is not known why there are two different direct versions, but it is a good bet that the version with the UPC symbol is probably a mistake that was caught during the printing process and fixed. Both versions are found in Whitman 3-packs and there is no discernible difference in the price among the 3 versions. Much of science fiction has its roots in the western genre and Star Wars is no different. For example, Han Solo is the quintessential space cowboy and the cantina in Mos Eisley evokes images of saloons in many western stories. Star Wars #7 has a decidedly western theme with Han and Chewbacca fighting to bury a cyborg in a cemetery named Spacer's Hill. More famously, Star Wars #8 - 10 borrows the plot from Magnificent Seven, a classic American western film. Star Wars #66 returns to Star Wars' space-western roots with an overtly western influenced story about Luke Skywalker helping a moisture farmer defend her ranch from thieves in a story aptly named Water Bandits. The cover for Star Wars #66 is very similar to the splash page for that issue. In the previous issue, Luke's X-Wing Fighter was damaged in an attack on the former Rebel base on the planet Golrath. The rest of the alliance was able to make a jump to hyperspace, but Luke is forced to set down on the planet Beheboth to escape a squadron of TIE Fighters. 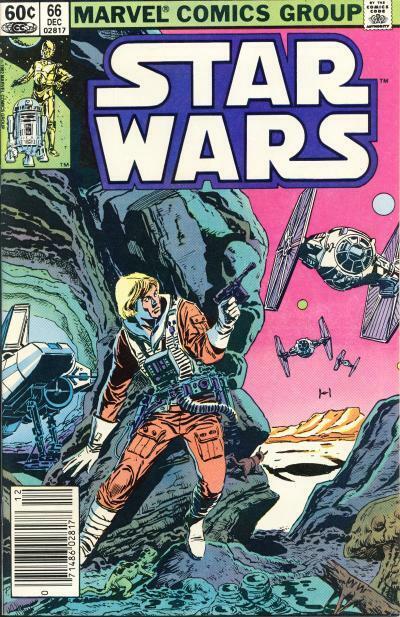 The cover shows Luke's X-Wing hidden in a cave while Luke looks on as a TIE patrol flies nearby. Everything about the cover to Titans #67 is better except for one glaring mistake, Luke's X-Wing Fighter is not hidden in a cave! The X-Wing Fighter appears to be out in the open where the TIE Fighters can easily detect it. It is interesting to note that on both covers, Luke is wearing the white gloves used when flying the Snowspeeder on Hoth. On the French cover, Luke has black boots instead of the white worn on the U.S. cover. 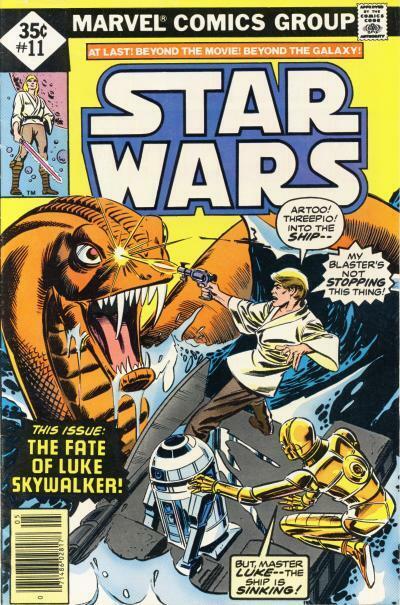 Additionally, the cover to Star Wars #66 shows 2 lizard-like creatures near Luke that are absent on the cover to Titans #67. I like the yellow and orange color scheme to Titans #67 which makes the planet look more arid and thick with dust than the purple on Star Wars #66. 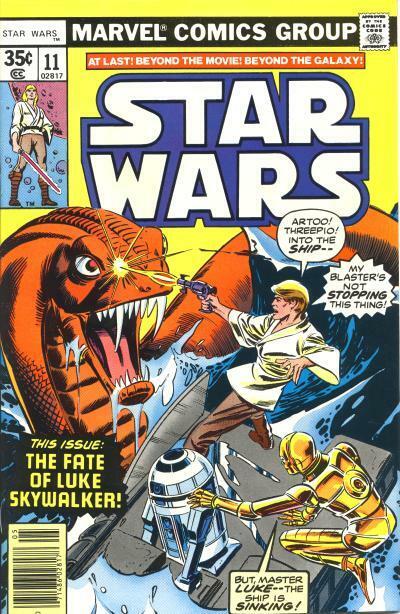 Overall, Star Wars #66 has one of my favorite covers in the original Marvel Star Wars title. I have always believe Star Wars #51 and 52 contains the best Marvel story published. I think Return of the Jedi would be a better movie if our heroes infiltrated the Death Star II in a manner similar to how they infiltrated the Tarkin in this story. The cover for Star Wars #51 is a terrific piece of art by Walt Simonson. Simonson would go on to achieve fame in his classic run in Marvel's Thor title, but I feel Simonson's art is also one of the highlights of Marvel's Star Wars title. 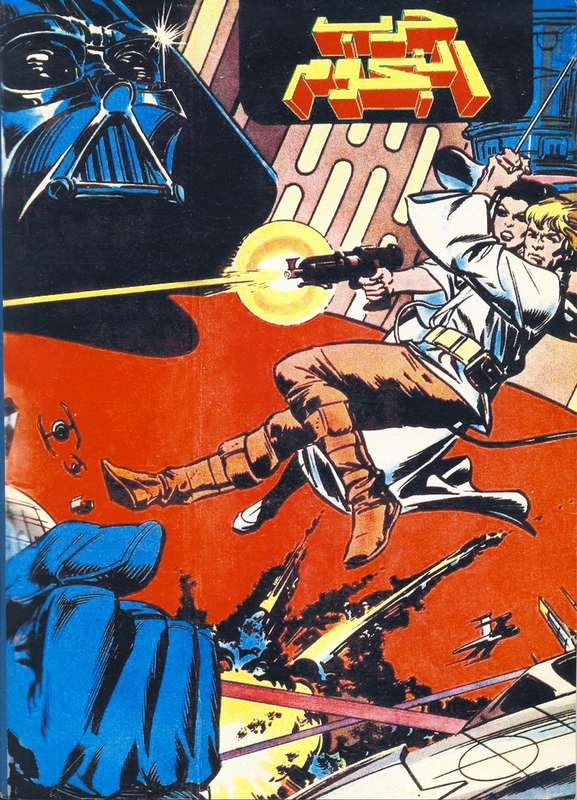 Carmine Infantino left his indelible mark on the Star Wars title pre-The Empire Strikes Back and Walt Simonson did the same after The Empire Strikes Back movie adaptation. This cover shows Luke Skywalker on an unnamed asteroid being attacked by a AT-ST after discovering an Imperial communications beacon. The cover to Titans #52 captures the same scene. Despite my propensity to enjoying the French painted covers more, in this case, I think the U.S. cover is superior for one main reason, the drawing of Luke Skywalker. Luke Skywalker has such incredible hair on the cover to the French comic that he really does look like a female. Additionally, the French cover shows a startled Luke that looks like he is on the verge of turning around and running away from his adversary or is going to break down and start crying. On the U.S. cover Luke is all business as he defends himself from the oncoming mechanical menace. There is one aspect of the French cover that I like more and that is the star filled backdrop. I have a fondness for covers where the characters are on an atmosphere-less planet and you can see space. In the comic, there is an atmosphere on the planetoid however, so the U.S. cover is more accurate. The Comics Chronicles has released the August estimated sales and all the Star Wars titles slipped although there is no huge placement different on the top 300 chart. 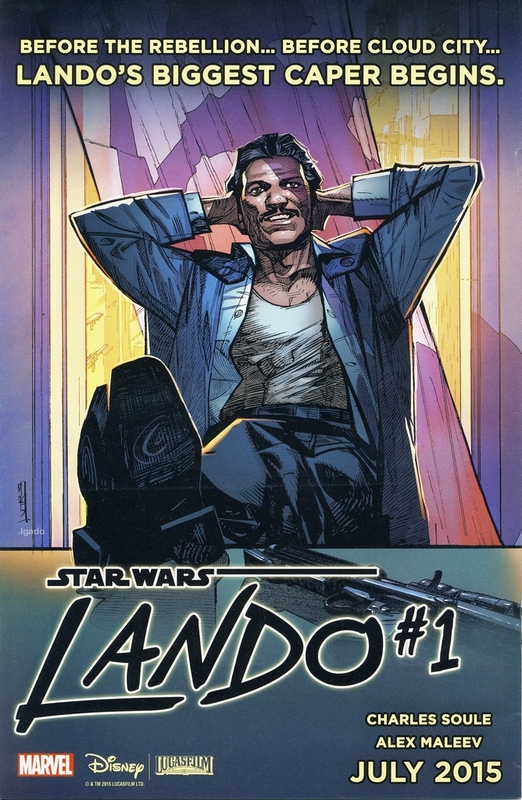 Star Wars: Lando #2 saw a 63% drop in sales from the 1st issue which is inline with both the Darth Vader and Princess Leia titles. My prediction last month that Lando would finish stronger than the Princess Leia mini-series due to the positive reaction is probably not going to happen. Both the 2nd and 3rd issues for Lando sold less than Princess Leia final issue's 77,465 sales estimate. Last month, the Star Wars and Darth Vader titles saw an increase in sales, but this month both saw a decrease in sales giving up the gains from last month. Star Wars #8 lost about 15,000 sales, putting the sales level around the same level as the lowest selling 5th issue. 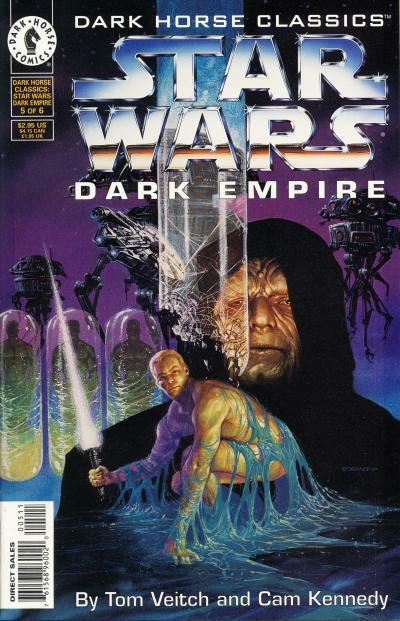 Darth Vader #8 saw a decline of about 16,000 copies, which keeps its sales numbers above the lowest selling 3rd issue by about 13,000 copies and around the same level as the 2nd issue. The volatility in the sales numbers from month to month for these 2 titles means retailers are still trying to find the proper sales level. The main Star Wars title has replace Batman as the top selling ongoing series but with Marvel's reboot due in a few months, it will be interesting to see if it can hold onto that accomplishment. Kanan has shed almost 6,000 more copies from last month, so my thinking this title was stabilizing sales is now in doubt. It is still selling well when compared to Dark Horse's Clone Wars series and there should not be any concern for the title to be cancelled. 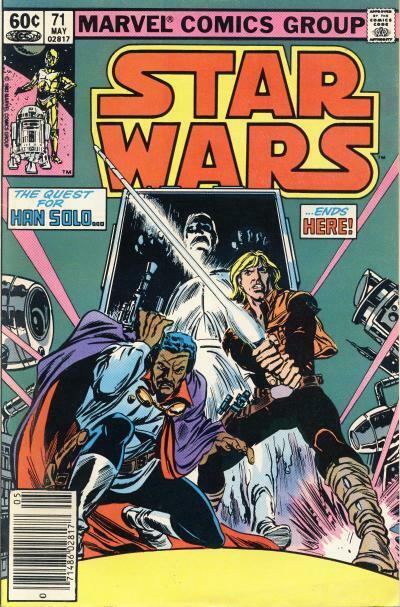 Marvel has not solicited a reprint for any Star Wars issues since Star Wars: Lando #1 saw a 2nd print. While the average sale per issue is down significantly this month, that average still would rank 6th on the top 300 chart for the month of August. Take a look at the Star Wars Sales Estimate tab above and please read the blog posting August 2015 comics sales estimates online; Secret Wars #5 tops 200k. For the 8th month in a row, Star Wars titles from Marvel Comics continue to place high on the sales charts. In August, Star Wars #8 jumps 2 places to 2nd place, Darth Vader also jumps 2 places to 4th place, and Lando #2 falls from 2nd place to 10th place. And this was done in what was a strong month for comic sales. Head over to The Comics Chronicles to read more. Toward the end of 1986, Marvel Comics had already published over a year of Star Comics issues. Star Comics was an imprint that Marvel used to publish humor books aimed at young audiences. Archie was having success with a digest-sized format of comics that reprinted several Archie stories, so it was only naturally that Marvel would try the same format. In December 1986, they published Star Comics Magazine #1. Star Comics Magazine would last only 13 issues and just 4 of the issues would contain Ewoks reprints, issues #1 - 3 and 5. No Droid reprints would appear in the title. 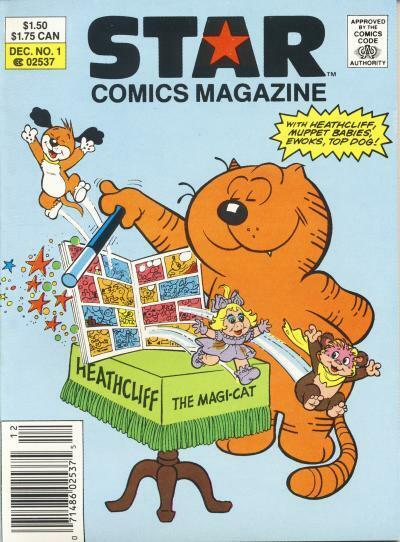 Star Comics Magazine #1 contains reprinted stories for Heathcliff, Top Dog, and the Muppet Babies in addition to Ewoks. 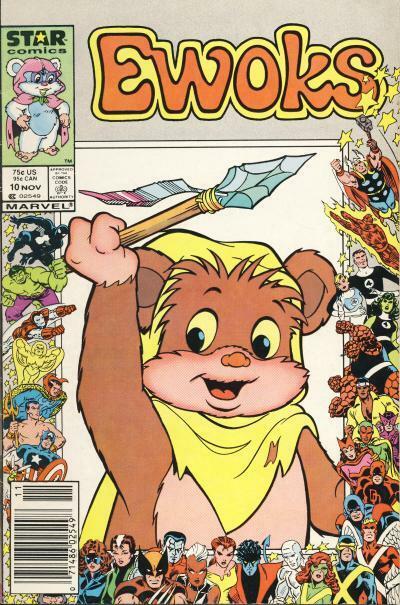 Wicket would represent the Ewoks on all 4 covers that contained Ewoks reprints and the first issue reprints Ewoks #1. 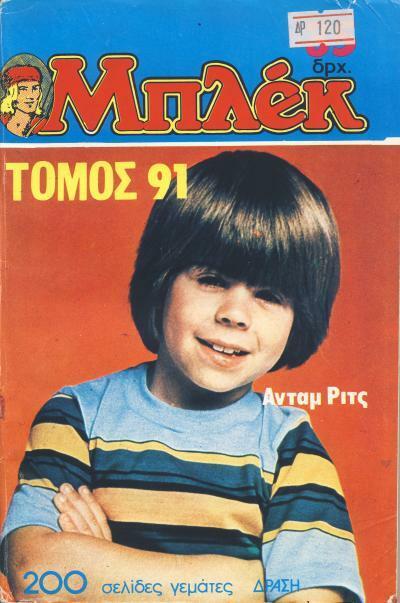 The weekly digest-sized anthology comic Μπλεκ in Greece was collected into tomes. It is a standard practice in many foreign countries to rebind individual issues into collections for resale. These particular collections consist of 3 complete Μπλεκ single issues, including covers, contained inside another outer cover. The issues are glued to the outer cover at the spine. It is common to find individual issues of Μπλεκ which have a very rough left edge. These are most likely individual issues that were separated from these tomes. If you notice, these tomes are numbered higher than the individual issues they contain. This is because these collections span the 3 volumes of Μπλεκ that were published between 1969 and 1994. Each volume restarted the number at 1 and these 2 tomes collect individual issues from the 3rd volume. These covers have photos that have nothing to do with the content inside. 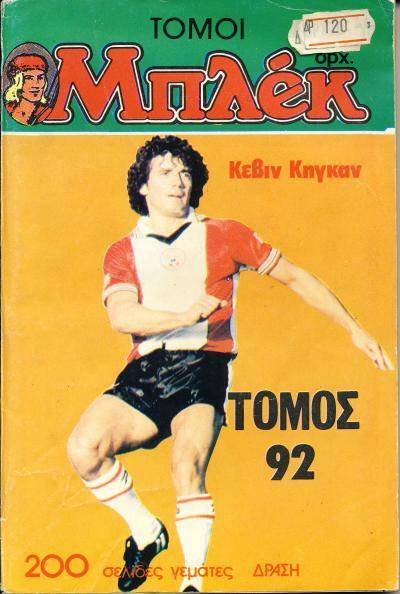 Μπλεκ ΤΟΜΟΣ #91 shows Nicholas Bradford from the Eight is Enough TV series and Μπλεκ ΤΟΜΟΣ #92 shows legendary soccer star Kevin Keegan wearing his Southampton uniform. I love these issues because nothing on the cover indicates that there is a Star Wars comic inside! These 2 tomes contain most of the Star Wars adaptation. Presumably Μπλεκ ΤΟΜΟΣ #93 contains Μπλεκ #71 which has the final pages of Marvel Star Wars #6. I will have to track that tome down so I can finally see how this whole Star Wars story ends! In 1954, a comic named Il Grande Blek was published in Italy and received considerable success. Il Grande Blek starred a blonde haired trapper who fought the British for American independence during the American Revolutionary War. Il Grande Blek went on to be published in Greece, Turkey, France, Yugoslavia, and other countries in Europe. In 1969, Stelios Anemodoura brought Il Grande Blek to Greece in Μπλεκ a weekly digest-sized comic named after the Italian comic. The first volume ran for 428 issues. 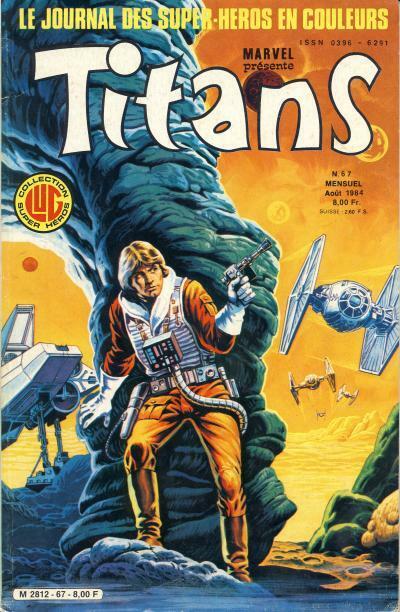 In 1977, the second volume began and only ran for 120 issues. 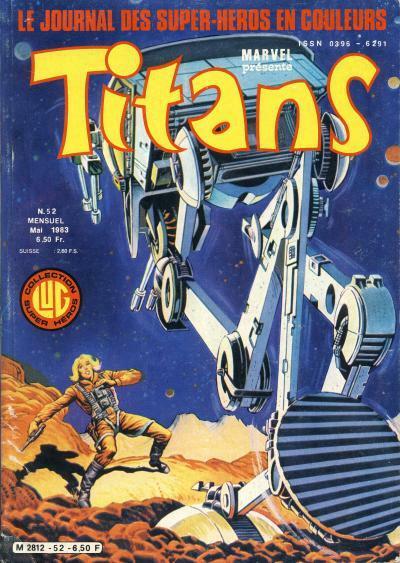 Finally, in 1979, the third volume began and ran for 756 issues until 1994. At it's peak, the Greek comic would reach a circulation of 130,000 copies. Initially, Μπλεκ would just publish stories about Il Grande Blek, but over time, other stories would be publish to keep the content of the comic fresh. 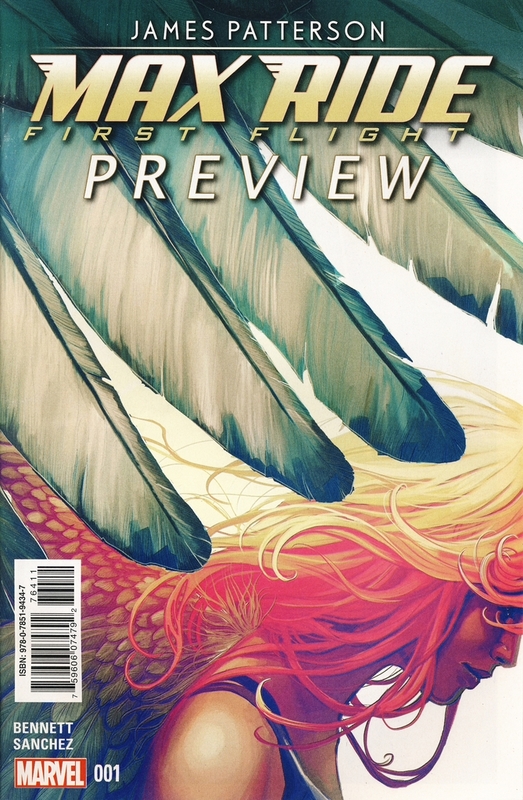 Each issue contains multiple different stories making the title an anthology. The comic reflected the Greek pop culture of the time and would feature covers with sports, TV, and movie stars as well as comics. 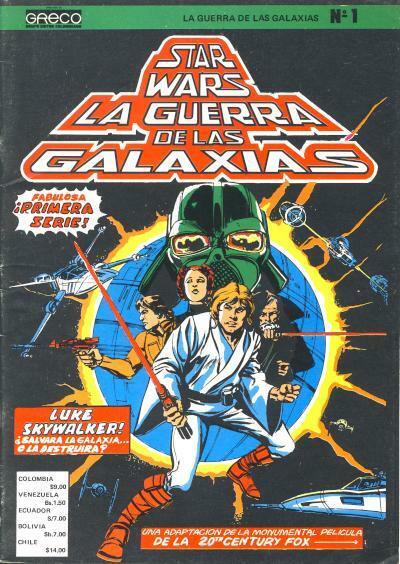 It is no surprise that the Marvel Comic adaptation of Star Wars would find its way into the pages of Μπλεκ in the third volume. The cover to Μπλεκ #65 is the same cover as Star Wars #1 framed with a green border. 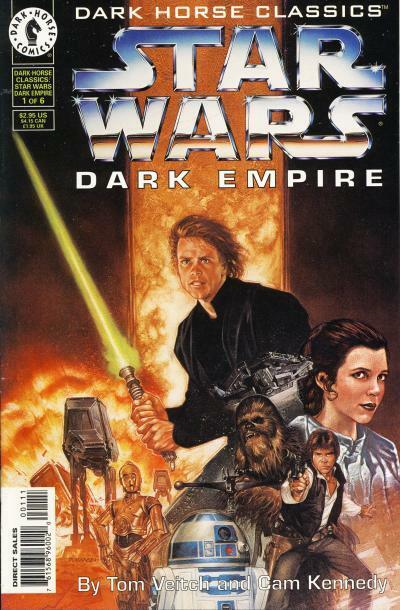 In addition to the verbiage, the cover was altered to show a picture of Mark Hamill as Luke Skywalker in the upper left hand corner and Carrie Fisher as Princess Leia where the UPC symbol usually appears. 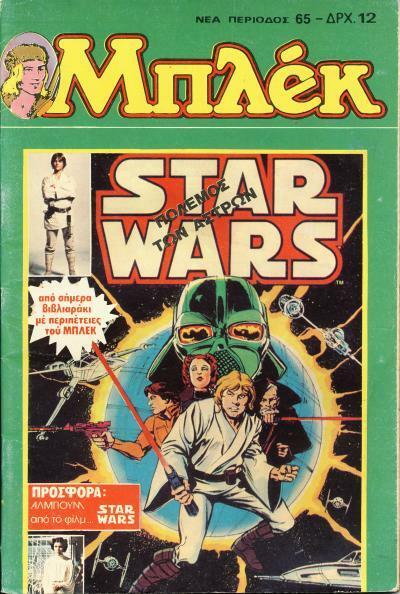 The Star Wars adaptation was spread over 7 issues from Μπλεκ #65 to 71. For this reason, each issue did not contain a complete issue from the Marvel comic. For example, Μπλεκ #65 contains Star Wars #1 minus the last page. The modern era of the legendary tangle !! For Marvel Comics cover dated November 1986, many of the covers sport a border featuring the main Marvel superheroes. This border, which is the same on all the titles, was used to celebrate Marvel's 25th anniversary. Not all titles from that month have the border including: mini-series, annuals, New Universe imprint titles, Epic imprint titles, and Marvel Fanfare. The Star Comics imprint titles cover dated November 1986 have the border. 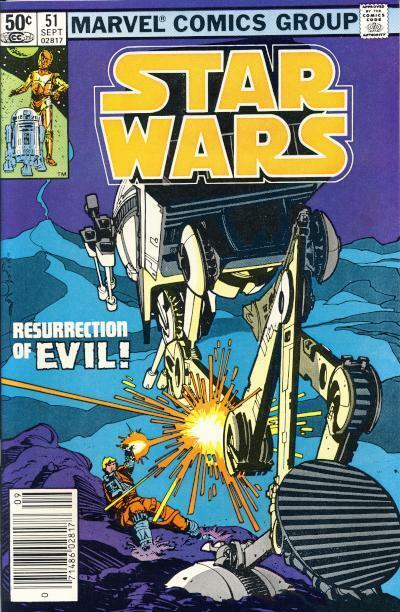 The main Star Wars title had ended 2 months earlier and Droids was being published bi-monthly alternating with Ewoks. Ewoks #10 is the only Star Wars title published that month so it has the distinction of containing the Marvel 25th anniversary border. Like all these issues with the border, the cover features the head of one of the main characters from the title. It only makes sense that Wicket W. Warrick, arguably the best known Ewok, would be that title's representative on the cover. 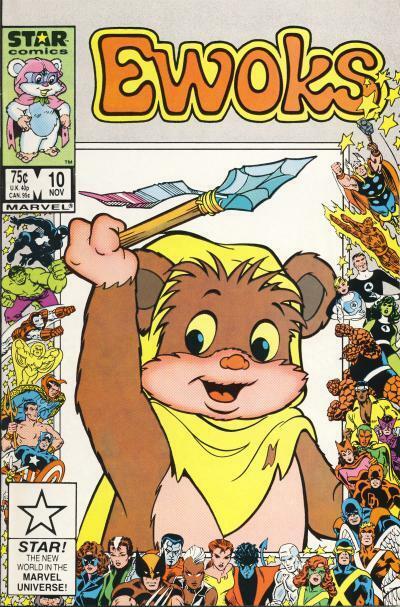 Since the Ewoks comic is based on the cartoon, Wicket is drawn in the same style of the cartoon. Interestingly, through all 14 issues of this title, his hood and cape are yellow whereas in the cartoon it is either orange/brown or green. There were not as many Star Comics issues published in general when compared to Marvel's superhero titles. For this reason, Ewoks issues are priced higher than many of the regular Star Wars title issues. Ewoks #10 in NM condition usually sells for $10 - 15 on eBay. 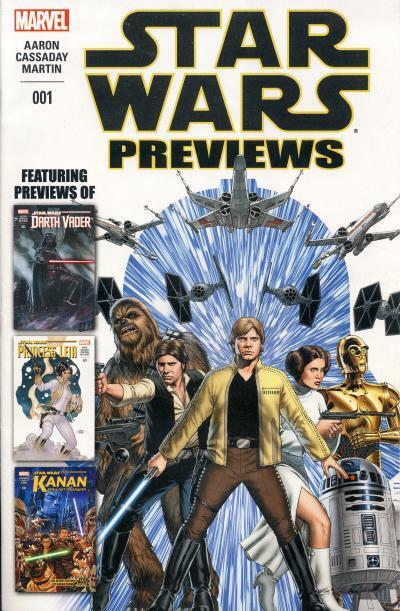 At the Star Wars Celebration 2015 in Anaheim, 2 different versions of the Star Wars Previews #1 were distributed. One preview has a Star Wars: Lando ad on the back and the other has the Max Ride: First Flight Preview #1 on the other side. This version with the Max Ride preview was also distributed at New York BookCon 2015. 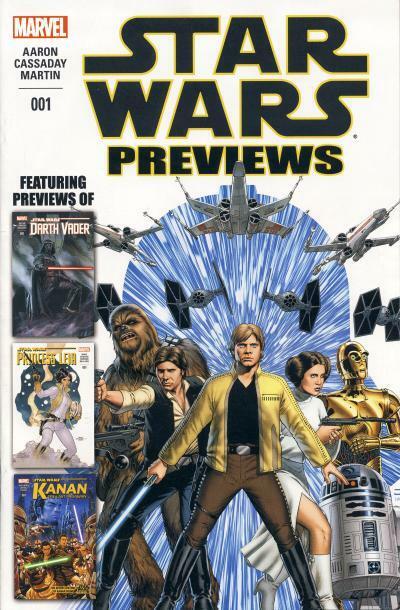 The 4 Star Wars comics featured in this book are Star Wars #1, Darth Vader #1, Princess Leia #1, and Kanan - The Last Padawan #1. The comic pages from these issues are used to promote the first trade paperbacks for these 4 titles that are coming out later this year. 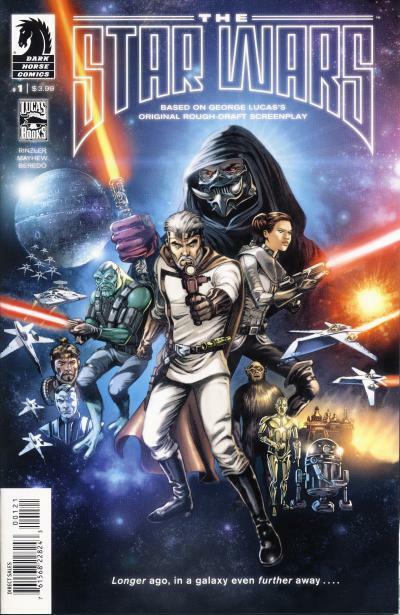 The front cover and Star Wars pages inside both versions of this comic are identical. The version with the Max Ride preview has more pages. Neither version seems to be harder to find than the other and both seem to sell for around the same price on eBay. These 2 issues should not be confused with the Marvel Previews which came with the Previews magazine and features 5 pages from Star Wars #1 but is mostly non-comic page ads for Marvel's entire comic line. The reprint title, Dark Horse Classics - Star Wars: Dark Empire, uses the same cover art as the title it reprinted, Star Wars: Dark Empire. There is one change to one of the covers however. 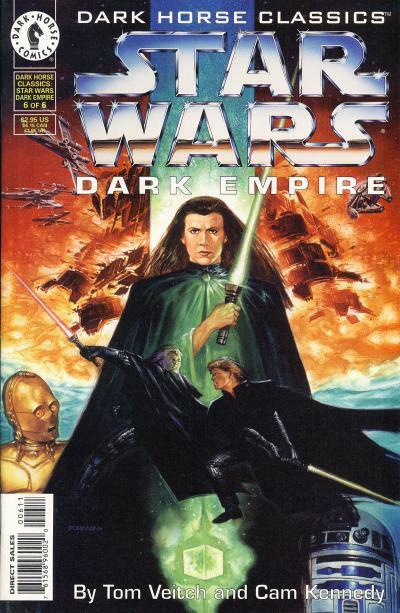 Princess Leia on the cover of Star Wars: Dark Empire #1 is representative of how she appears inside the series. She looks slightly older than she does in the movies, but it is easily recognizable as Leia. For the reprint, Leia was changed. She looks a little younger and is wearing the hair style she wore on Bespin in The Empire Strikes Back. I have never seen this cover change mentioned, so it is not clear why Dark Horse made this change. I prefer the original cover because it shows Leia with a little more emotion than the Leia on the reprint. Considering the actions being taken by the other main characters, Leia on the reprint cover looks too uninterested and feels out of place. In 1996, Dark Horse Comics celebrated it's 10th anniversary. That same year in March, they released a one-shot titled Dark Horse Classics which reprinted Predator: Jungle Tales #1, a reprint itself that collected Predator stories from the Dark Horse Comics anthology title. This title kicked off the Dark Horse Classics line of comics which reprints previously published Dark Horse titles. In 1997, Dark Horse Classics: Aliens Versus Predator and Dark Horse Classics - Star Wars: Dark Empire were published. The following year, Dark Horse would print 3 more Dark Horse Classics titles, all featuring Godzilla, but the sales proved to be too low and this attempt at a reprint line ended in January 1999. The final title in the line, Dark Horse Classics: Terror of Godzilla has estimated sales of just 2500 copies for its 6th and final issue. 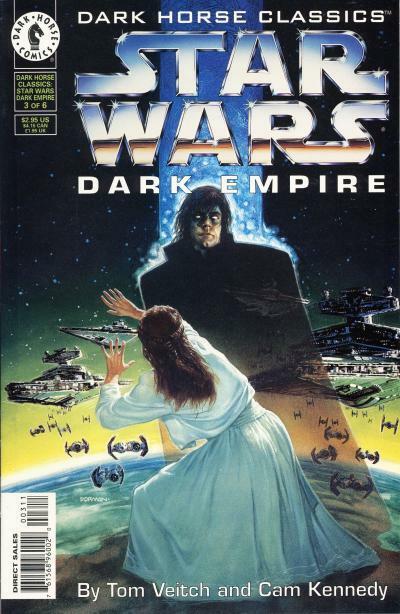 Dark Horse Classics - Star Wars: Dark Empire reprints the Star Wars: Dark Empire mini-series that inaugurated Dark Horse's Star Wars line of comics including the covers. 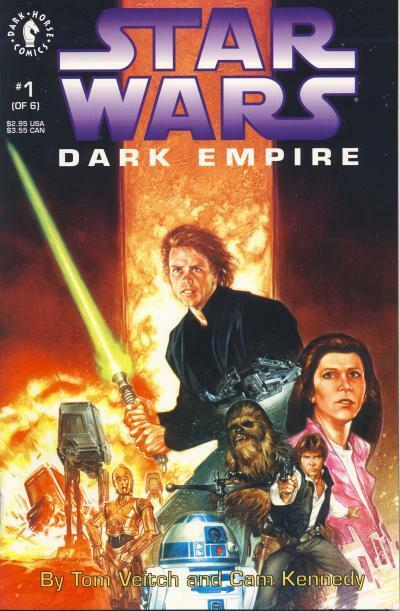 Due to the same cover art used on this series, many sellers on eBay erroneously list issues in this title as just Star Wars: Dark Empire and neglect to mention this is a reprint of that title. 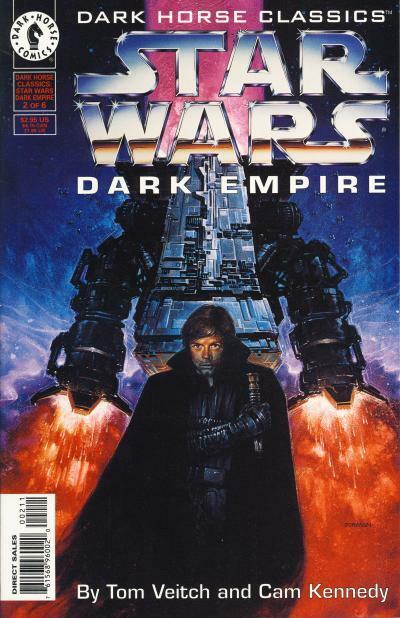 Dark Horse Classics - Star Wars: Dark Empire was one of the lowest selling Star Wars titles that Dark Horse published at the time. In an era that saw many Dark Horse Star Wars titles in the top 100 any given month, this reprint title sold an estimated 10,000 to 13,000 copies per issue or less than half of the next lowest selling Star Wars title. Just How Much of an Impact Are Star Wars Sales Having? Marvel Comics has been having a stellar year when compared to its competitors. Bleeding Cool has an interesting take on just why Marvel has been outdistancing its nearest competitor, DC Comics, with regards to sales in an article titled Could Star Wars Become The Third Biggest Publisher In Comic Book Stores?